The mashup: This icy booze popsicle debuted in London over the summer at high-end stores like Selfridges and upper-crust yachting events. At 37% champagne, it’s roughly equivalent to half a glass of bubbly in terms of alcohol, although priced more like a full glass at £5–£10 ($8–$16). Staying power: High. With cutesy yellow champagne flute packaging and less than 100 calories per popsicle, we can see posh young ladies sucking daintily on these at the races or the tennis, at least until someone comes up with a frozen G&T. 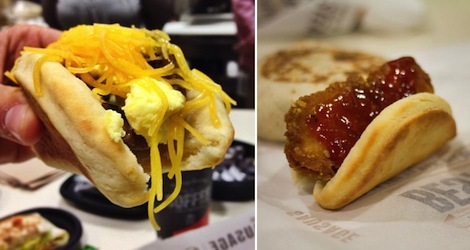 The mashup: Taco Bell is testing this Southern-inspired breakfast item in California this week, having already received positive reviews from customers in San Antonio, TX and Atlanta, GA. Fillings include bacon, egg, and cheese; sausage and gravy; and crispy chicken with gravy or a jalapeño-infused honey. Staying power: High. What’s not to like about a buttermilk biscuit breakfast sandwich that can be held in one hand? While it probably won’t reach Doritos Locos popularity, we can see it giving the waffle taco a run for its money. 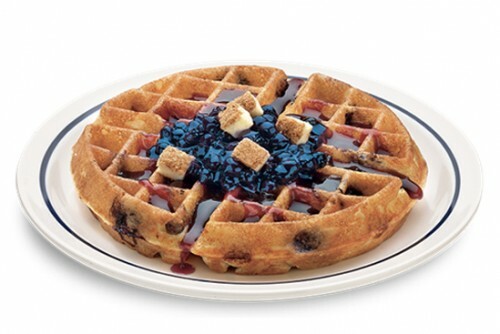 The mashup: iHOP’s new Waffullicious Waffle is a bit like a cheesy crust pizza, in that the toppings are also baked into the batter. There are currently two flavors: one with bacon and cheddar (ho hum), and one with chunks of New York cheesecake and blueberry compote (oh hi!). The mashup: Stefano’s Golden Baked Hams in Yorba Linda, CA swapped one type of bread for another to make this pressed cheeseburger. The patty is a blend of chuck, short rib, and brisket, and it’s topped with garlic-jalapeno cream cheese, bacon, avocado, tomato, onion, and cheddar.